John is a loving husband, father, brother, uncle, and great uncle to many children, who grew up in Bangor, Maine and is raising his family there as well. John attended St. Mary’s School and Bangor High School, where his son now goes. Baseball has always been important to John and he has played in many leagues and watched his children, nieces and nephews at the fields on countless days and nights. It has devastated him that he has not felt well enough for the past few years to continue to cheer on his family in their various activities. He has also missed playing golf, especially with his sons. As a young child John helped his father and older brother as they worked as stone masons. Many years later, John started his own masonry business and became a well-known and respected brick layer. Over the years, the dust and chemicals from the job took their toll on John’s health as he was diagnosed with COPD, sarcoidosis, and pulmonary hypertension. His health continued to decline and John needed a lung transplant. 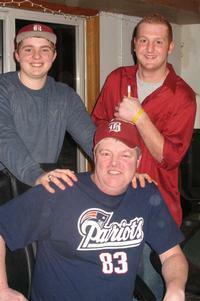 On June 13, 2012, John received his gift of life — a bilateral lung transplant. He is doing well and on the road to recovery. Even with insurance, John will have many uninsured, transplant-related expenses such as: co-pays and deductibles, doctor visits, temporary travel and relocation to the Cleveland Clinic and the costly immunosuppressant medications that he will need to take for the rest of his life. To help offset his uninsured costs, a fundraising campaign in John’s honor has been established with HelpHOPELive (formerly NTAF), a nonprofit organization that has been assisting the transplant community for nearly 30 years. All contributions are tax-deductible, are held by HelpHOPELive in the Northeast Lung Transplant Fund, and are administered by HelpHOPELive for transplant-related expenses only. You can help make a difference in John’s life. Please consider making a contribution.Thank you in advance for your support as we all work together to help John and his family. John has been learning his limitations these past 3 years since transplant. He visits Cleveland regularly for check ups. He is going back to school for accounting. He spends a lot of time with his family and snuggles with his new grandson, Carson. In June, he and Lee (his wife) met the donor family. It was an overwhelming, inspiring experience. John has had new lungs for a year and a half! He is doing well and continuing to adjust to changes such as taking many medications everyday. He is able to do more each day and is so grateful to everyone who made this all possible.